This litter was out of Ch. Dauntless Duking It Out CD CGC and Ramstaff Molly Sweet Spot. Our girl Georgia is the third from the left. This litter was out of Ch. Dauntless Duking It Out CD CGC and Ch. Hogan's Reba Abbigail. This litter was out of Ch. Rockstaff Mr. Pibb CGC and Rockstaff Say It Ain't Zo CGC. This litter was out of Ch. 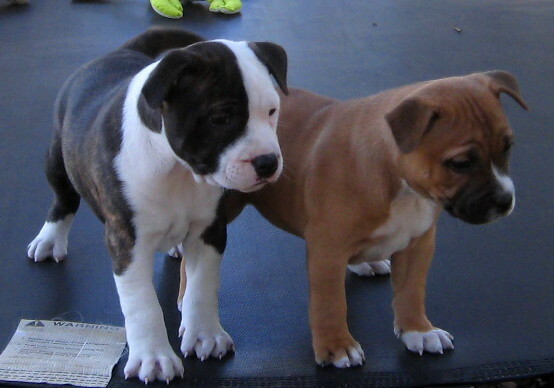 Mimes-Staffs Red Rebel and Sheza Hunny Pooh CD CGC. Holly, Buddy, and Jasper are from this litter. This litter was out of Ch. Pinehill's Mr. Impressive and Rockstaff Bella Georgia CGC. Both Pibb and Sugar came from this breeding. This litter is out of Ch. Rockstaff Mr. Pibb CGC and Ch. Rockstaff Summertime CGC. Our girl Sprite is in the middle. This litter was out of Ch. Dauntless Duking It Out CD CGC and Ramstaffs Lil Miss Sadie Mae. This litter is out of Ch. Mimes-Staffs Red Rebel ROM and Sheza Hunny Pooh ROM CD CGC. Diamond is second from the right. This litter is out of Ch. Dauntless Duking It Out CD RN CGC and Ch. Rockstaff Summertime CGC. This litter is out of Ch. Rockstaff Mr. Pibb CGC and Ch. Rockstaff Hollywood Starlet CGC. Sassy is second from the right. These babies are out of Ch. Rockstaff Red Jasper Of Mine CGC and Ch. Rockstaff Bella Georgia ROM CGC. This litter is out of CZ. import Fabio Pastaff Legion and Ch. Rockstaff Wintertime Sprite. This litter is out of GCH. Rockstaff Wintertime CGC and UK imp. BIS BISS GCH. Prada Classic Aran Isle At Donnellas CGC. These babies are out of GCH. Rockstaff Celtic Guardian and CH. Rockstaff Will-O'-The-Wisp.